Universal lightweight long steel tape with high impact polystyrene case. Yellow clad blade .005"/0.13mm thick. Easy wind nylon drum; easy-to-read black and red markings. Hook ring is retained neatly in the contoured mouth of the case. Removable belt clip. Graduated feet and inches to 1/8ths with instantaneous readings; 16" centers indicated by a diamond. High impact, high visibility, yellow ABS case houses thick, wide yellow blade coated with polymer for enhanced durability; easy-to-read markings. Easy-wind drum ensures streamlined usage. End hook recoils neatly into contoured case. Open four arm frame design protects blade, does not trap dirt in case. Lightweight, strong, easy to handle and rewind, orange case is easy to find and two material grip is comfortable to use. Yellow clad fiberglass blade impervious to moisture. Folding end hook for true-zero measurements. Feet and inches graduated to 8ths; numbered feet and instantaneous feet. PVC blades allow tape to be wound wet and easily cleaned. High impact ABS case for durability, wide blade with easy-to-read fractional/decimal, inch/foot markings. English formats for versatility. Rubber grip is designed with comfort in mind, easy to find yellow color. High impact, high visibility, yellow ABS case houses thick, wide yellow blade coated with polymer for enhanced durability; easy-to-read markings. Easy-wind drum ensures streamlined usage. End hook recoils neatly into contoured case. Universal lightweight long steel tape with high impact polystyrene case. Yellow clad blade .005"/0.13mm thick. Easy wind nylon drum; easy-to-read black and red markings. Hook ring is retained neatly in the contoured mouth of the case. Removable belt clip. Graduated feet and inches to 1/8ths with instantaneous readings; 16" centers indicated by a diamond. Open four arm frame design protects blade, does not trap dirt in case, easy to handle and rewind. Yellow clad fiberglass blade impervious to moisture. Two-material grip is comfortable to use, easy to find orange case. Folding end hook for true-zero measurements. Engineer's blade in 10ths and 100ths of feet plus feet. Open four arm frame design protects blade, does not trap dirt in case. Lightweight, strong, easy to handle and rewind, orange case is easy to find and two material grip is comfortable to use. Yellow clad fiberglass blade impervious to moisture. Folding end hook for true-zero measurements. Feet and inches graduated to 8ths; numbered feet and instantaneous feet. Overmold layer of thermoplastic rubber (TPR) for comfort and impact resistance. Ny-Clad nylon powder coated blade lasts longer, 5-rivet reinforced end hook, 3:1 gear ratio for fast blade retrieval. Premium steel blade resists kinks. Black and red blade markings one side only. Graduated feet and inches to 1/8ths with instantaneous readings; 16" centers indicated by a diamond. Open four arm frame design protects blade, does not trap dirt in case. Lightweight, strong, easy to handle and rewind, orange case is easy to find and two material grip is comfortable to use. Yellow clad fiberglass blade impervious to moisture. Folding end hook for true-zero measurements. Feet and inches graduated to 8ths; numbered feet and instantaneous feet. Tough, molded handle is easy to grasp and rapid reeling with Ultra-glass blade. The crank handle is reinforced with metal to provide years of rugged use. Double throat rollers guide the blade return and prevent the tape from twisting. Double screws to hold the housing together in the event of a drop. Graduations on one side in feet, inches and 8ths; 1/8" hook end hook. High-impact yellow ABS case with black rubber, non-slip grip for easy handling. Stainless steel blade for long life and 3 to 1 gear drive for faster rewinds. Tru-Zero end hook for inside and outside measurements. Steel roller cage protects case from being cut by blade during retraction. Open four arm frame design protects blade, does not trap dirt in case. Lightweight, strong, easy to handle and rewind, orange case is easy to find and two material grip is comfortable to use. Yellow clad fiberglass blade impervious to moisture. Folding end hook for true-zero measurements. Feet and inches graduated to 8ths; numbered feet and instantaneous feet. Impact resistant, self-standing case. Heavy duty, 0.008"/0.2mm thick, yellow clad blade protected by an abrasion resistant coating. Extends, rewinds in less time. Easy to read bold black markings with hook ring at zero. Black and red markings 1 side only. Graduated feet and inches to 1/8ths with instantaneous readings; 16" centers indicated by a diamond. Impact-resistant, open reel,with large soft rubber grip handle. Nylon coating withstands extreme temperatures, water, and chemicals. Crank handle folds flat to prevent breakage. Flexible, high tempered steel tape core. Wear resistant graduations in feet, inches, and 8ths. Numbering starts at hook. 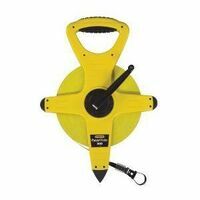 Stanley Tape Rule, Lockable, Open, Series: PowerWinder, SAE Measuring System, 300 ft Blade Length, 1/2 in Blade Width, Fiberglass Blade, Polymer Coated Blade, Yellow Blade, Graduations: 1/8 in and 1/10, 1/100 ft, Manual Rewind, Folding True-Zero Hook, Open Case, ABS Case, Yellow/Black Case, Resists: Abrasion and Corrosion, Includes: Belt Clip Open four arm frame design protects blade, does not trap dirt in case. Lightweight, strong, easy to handle and rewind, orange case is easy to find and two material grip is comfortable to use. Yellow clad fiberglass blade impervious to moisture. Folding end hook for true-zero measurements. Feet and inches graduated to 8ths; numbered feet and instantaneous feet. Interchangeable end hooks for user convenience. Ring end hook snaps onto stake for one person measurements, standard folding end hook for general measuring needs, appraiser's hook attaches to oversized objects such as downspouts. Cushion grips on handle and frame arms for comfort, 3-to-1 rewind for fast blade retraction, 2-sided blade, feet and inches on top, feet to 10ths and 100ths on bottom; 62 fiberglass strands and double-pvc coating for durability and strength. Automatic blade retraction saves time by eliminating manual rewind; rust-resistant coating prolongs blade life; metal case for heavy-duty use; blade-lock securely holds blade in position; spring loaded carabineer attachment for easy transportation. Tough, molded handle is easy to grasp and rapid reeling with Ultra-glass blade. The crank handle is reinforced with metal to provide years of rugged use. Double throat rollers guide the blade return and prevent the tape from twisting. Double screws to hold the housing together in the event of a drop. Graduations on one side in feet, inches and 8ths; 1/8" hook end hook. Break resistant, double nylon coated steel blades, 3/8" wide blade reduces wind drift and tape weight, graduations in 8ths. Metal reinforced crank handle for durability. Double screws to hold the housing together in the event of a drop. Tough, molded handle is easy to grasp and rapid reeling with Ultra-glass blade. The crank handle is reinforced with metal to provide years of rugged use. Double throat rollers guide the blade return and prevent the tape from twisting. Double screws to hold the housing together in the event of a drop. Graduations on one side in feet, inches and 8ths; 1/8" hook end hook. Break resistant, double nylon coated steel blades, 3/8" wide blade reduces wind drift and tape weight, graduations in 8ths. Metal reinforced crank handle for durability. Double screws to hold the housing together in the event of a drop. Interchangeable end hooks for user convenience. Ring end hook snaps onto stake for one person measurements, standard folding end hook for general measuring needs, appraiser's hook attaches to oversized objects such as downspouts. Cushion grips on handle and frame arms for comfort, 3-to-1 rewind for fast blade retraction, 2-sided blade, feet and inches on top, feet to 10ths and 100ths on bottom; 62 fiberglass strands and double-pvc coating for durability and strength. Rubber grip shovel handle for comfortable, rapid reeling, metal crank handle for durability, housing reinforced with rivets for strength. Nylon coated steel tapes are break resistant due to a .2mm thick permanently bonded nylon which is coated, not sprayed, over a sturdy .13mm steel core center. Multi-layer construction assures corrosion resistance to even salt water and provides at least 3 times the usual tape life. Zero point at end of hook; graduations in feet, inches, 8ths.